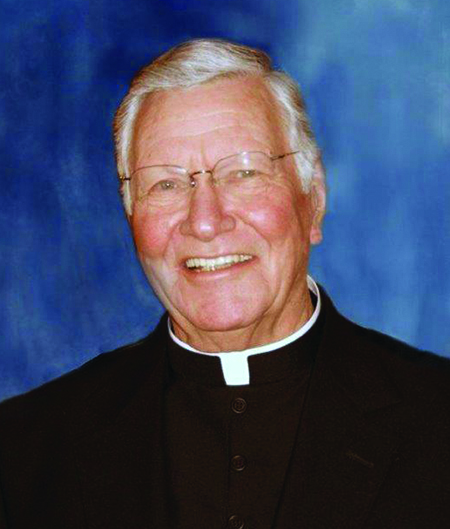 SCHAFFER — Father Paul Arthur Schiska, 92, of Schaffer, passed away on Tuesday, Sept. 4, 2018, at Cedar Hill Assisted Living in Bark River. He was born in Norway, Mich., on Oct. 30, 1925, son of John and Ida (Deehr) Schiska. He was raised in Norway and attended Norway Public Schools. After high school, he worked for three years at the Kimberly Clark paper mill in Niagara, Wis. From there he went to work for the Red Owl food chain. He was manager of a Red Owl Store in Green Bay, Wis, when he decided to enter the seminary. He spent three years at St. Lawrence Seminary at Mount Calvary, Wis., then two years at St. Paul Seminary in St. Paul, Minn., and then four years at St. John’s Provincial Seminary in Plymouth, Mich. Fr. Paul was ordained to the Priesthood on June 1, 1957, by Most Rev. Thomas L. Noa in Marquette. Years later, during two summers, he returned to St. John’s Seminary to take advantage of courses that were offered. He had a lifelong interest in photography, enjoyed music, both listening, singing and playing, skiing, deer hunting, motorcycling, flying (he earned a private pilot’s license), sailing and reading. He enjoyed puttering around in his workshop and was a dog lover. From 1975 on, he had a succession of Westies (West Highland white terriers), and he enjoyed them very much. Fr. Paul was a full time teacher at Holy Name High School and chaplain at St. Francis Hospital, Escanaba. He served as associate pastor at St. Sebastian in Bessemer, St. Paul in Negaunee, St. Ambrose in Ironwood, Administrator of Our Lady of Lourdes Parish, in Engadine with Mission of St. Stephen’s in Naubinway, St. Joseph’s in Gould City, and St. Timothy’s in Curtis and he was co-pastor of St. John’s Parish in Marquette. He was a pastor of Sacred Heart Parish in Champion with Mission of St. Agnes in Michigamme, St. Gregory’s Parish in Newberry, with mission of Our Lady of Victory in Paradise, St. Joseph and St. Patrick’s Parish and then Church of the Resurrection in Hancock with the Mission of Our Lady of Mount Carmel in Franklin Mine, Sacred Heart Parish in Schaffer, administrator of Sacred Heart Parish in L’Anse, St. George Parish in Bark River and Parochial Administrator of St. Thomas the Apostle Church in Escanaba. Fr. Paul was also involved as first diocesan coordinator of the Upper Peninsula Catholic Services Appeal, first managing editor of the Upper Peninsula Catholic Newspaper, appointment to the Stewardship Committee of the Michigan Catholic Conference, member of the Diocesan Personnel Commission, president of the Priest’s Senate, member of the Board of Directors of the St. Joseph Association, member of the Board of Directors of the Bishop Noa Home for Senior Citizens, chaplain of prison facility at Camp Baraga, member of the Priests’ Council of the Diocese of Marquette, member of the Diocesan College of Consultors to the Bishop, Dean of the Escanaba Deanery, and Episcopal Vicar for the Eastern Region of the Diocese of Marquette. He retired from active priestly ministry in 1990, and for quite some years he was busy providing help-outs to various parishes across the diocese. He is survived by his sister, Joy Bilski of Norway; several nieces and nephews; and special friends, Paul and Pat Cayer and Diane Inman, all of Bark River. Fr. Paul was preceded in death by his parents; brother and sister-in-law, John and Liz Schiska; sister, Rita Mae Weber; and infant brother, Anthony. The visitation will be held on Sunday, Sept. 9, from 4 to 8 p.m. EST at St. Elizabeth Ann Seton Church in Bark River, with parish prayers will be held at 8 p.m. Visitation will also be held on Monday, Sept. 10, from 9 to 11:30 a.m. EST at St. Elizabeth Ann Seton with the Mass of Christian Burial at 12 p.m. EST with the Most Reverend Bishop John Francis Doerfler officiating and priests of the Diocese of Marquette concelebrating. Burial will take place in the family plot in Norway Township Cemetery. A message of condolence may be directed to the family by visiting crawfordfuneralhomes.net The Crawford Funeral Homes are assisting the Schiska family.